Makers of the Lego films draw on their parental issues. 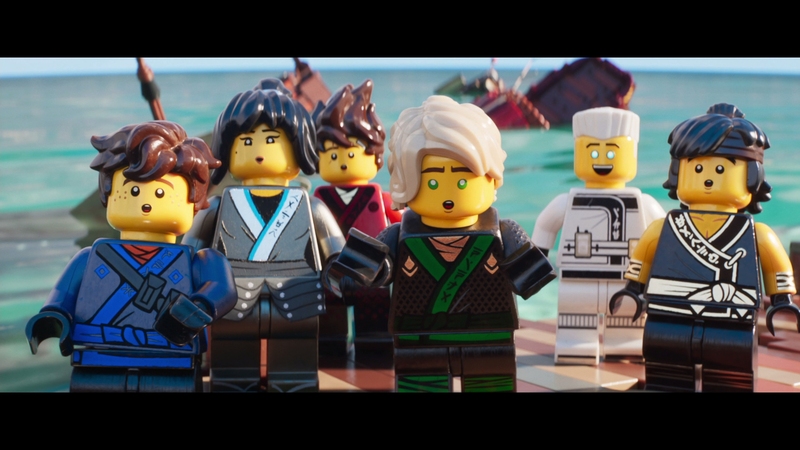 Each film, The Lego Movie, Lego Batman, and now Ninjago, deals with a plethora of unspoken feelings regarding fathers. 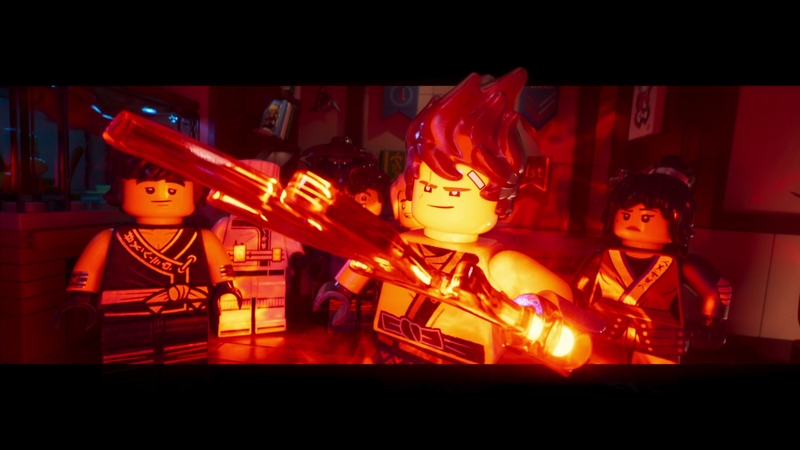 For Lego Ninjago, it’s Lloyd (Dave Franco) butting heads with father and super villain Garmadon (Justin Theroux). Garmadon isn’t even aware his child exists, let alone Lloyd is part of a Power Rangers-like group of super teens with uber robots bent on stopping evil. That’s a complicated relationship. Sticking with those themes, Lego Ninjago carries some familiarity. 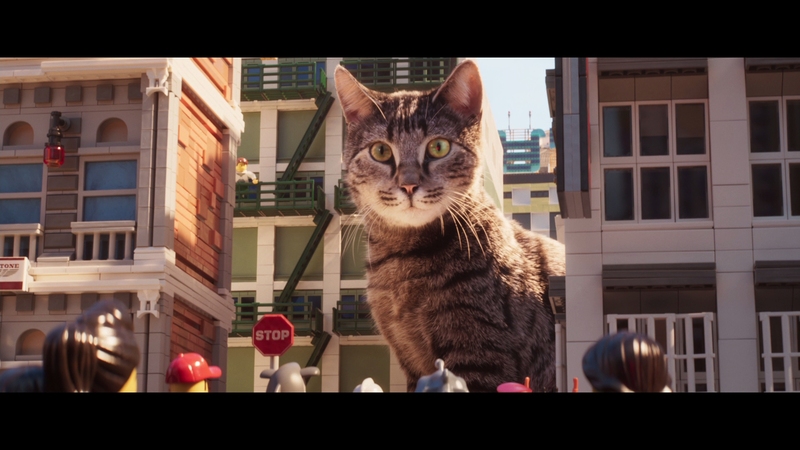 Like Lego Movie, there’s a particular style of brand positivity at work. In a book-end live action sequence, star Jackie Chan uses Lego people to prop up a bullied, friendless kid. Legos will save a generation from depression, or so the corporate branding goes. 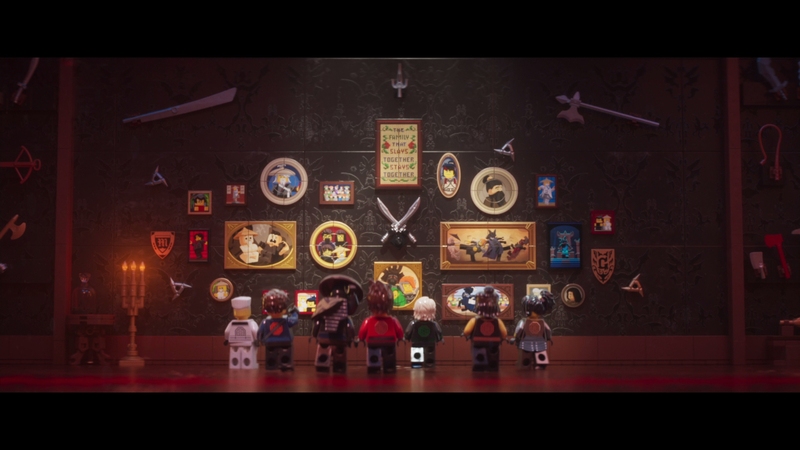 In the center of Lego Ninjago is the heart of a martial arts film. 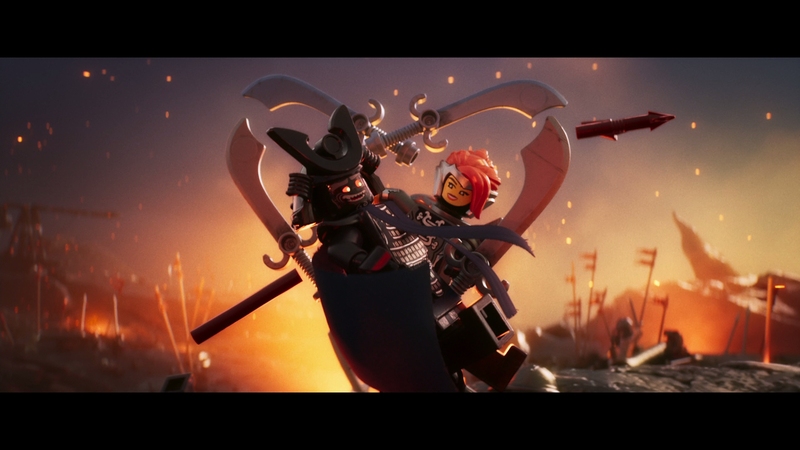 As much as Ninjago riffs on the meditation and training methods of Hong Kong cinema, fight scenes draw on the unreal fun of numerous classics. Chan, old enough to play the role of a gray bearded master, even earns a fun, prop-filled brawl. In the animation, Chan’s playful choreography shows through. With the kids jumping into their color-coded robots, that hint of Japanese tokusatsu adds a touch of easy levity (and a means of selling Lego kits). 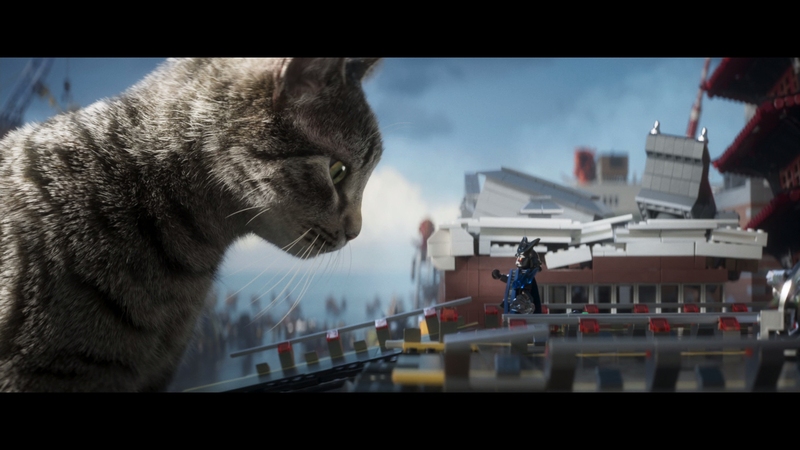 By the time a cat begins pummeling buildings, Lego Ninjago turns into a full on superhero story, furthering the Asian theme. Even if it’s schlock, there’s an earnest attempt to pay homage rather than slander an element of foreign entertainment. This is the quietest of the three Lego movies so far. The first never slowed, Batman drained its second and third acts, but Ninjago matures. While the opening sequences sling plenty of missiles and fire, afterward, the story appreciates a leveled pace. 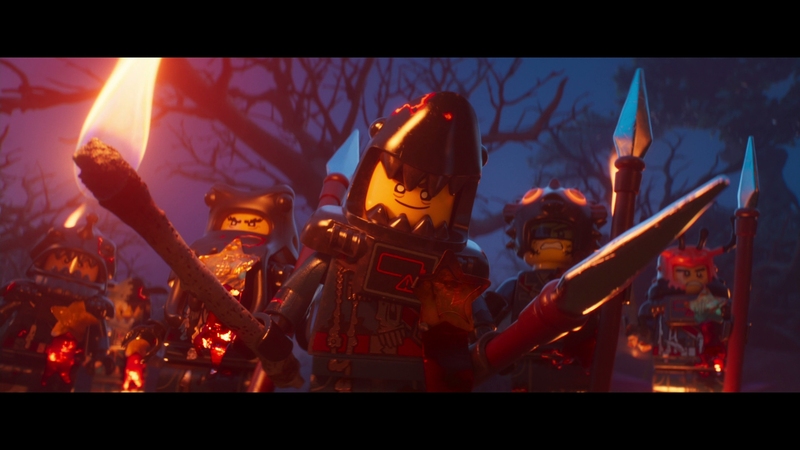 Lloyd and Garmadon go through predictable ups and downs in an effort to relate to each other. 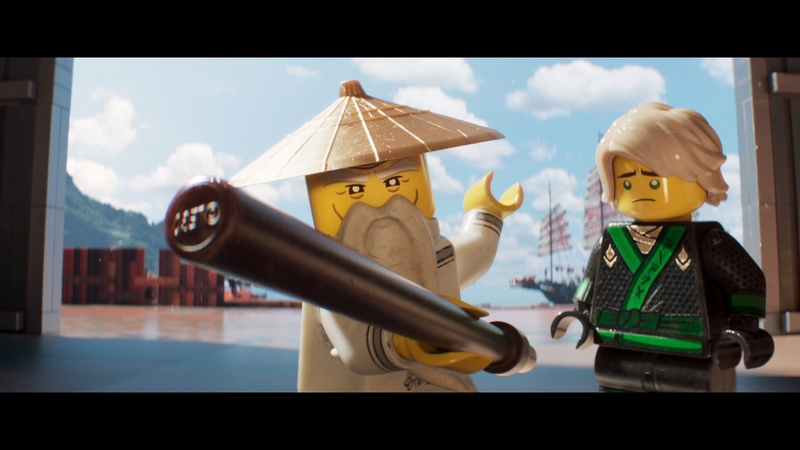 Lloyd overcomes his fear of isolation, Garmadon learns to appreciate his son (and turn away from evil, of course). None of this is surprising, but the slew of colors, gorgeously rendered Lego people, and sustained gags offers enough entertainment value. There’s a touch of exhaustion, or maybe it’s the lack of Lego Movie’s Christopher Miller and Phil Lord in the writing credits. Six writers penned the screenplay here, leading to a “by committee” feel to the delivery. It’s less organic than before and relies on the Asian mythos to get by. At least it has fun. Absolutely stunning. 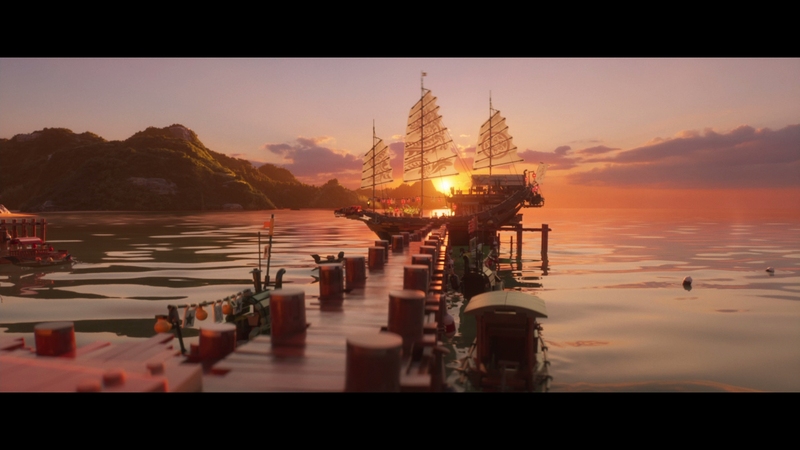 Lego Ninjago brings in the best of UHD, beginning with flawless levels of contrast. 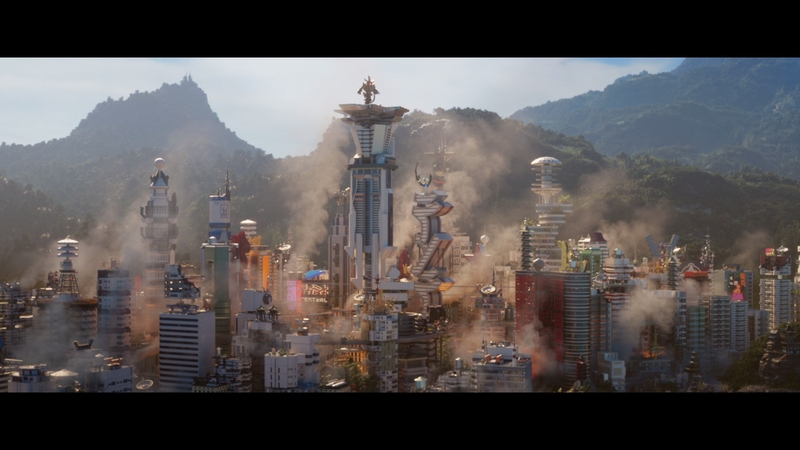 Sun-soaked Ninjago City glimmers and sparkles with marvelous HDR effects. Intense blacks of the ninja suits stand out, losing no detail in their inherent shadows. When night falls inside of a jungle area, there’s no loss of depth. Top that with dazzling levels of fine detail. 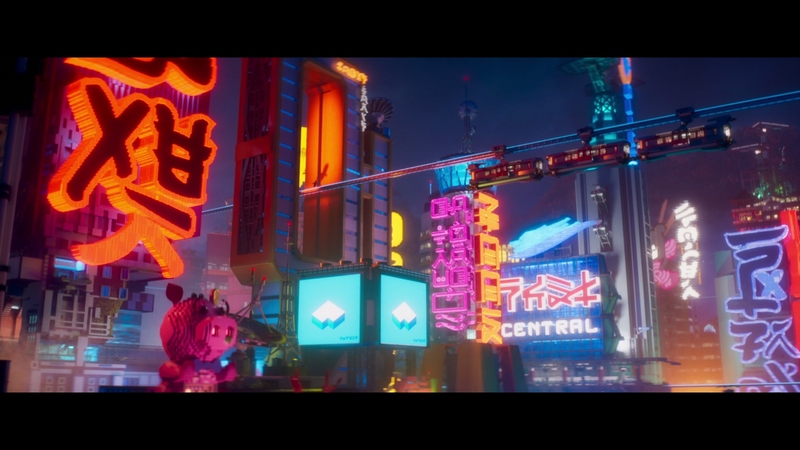 The work put into the textural qualities of Lego bricks begs for this 4K treatment, even if rendered at 2K. Substantial and packed images of the city match close-up clarity. Scenes of forested areas resolve realistic foliage. Add more thanks to the wide color, popping from the screen with sensational sunsets and incredible variety in the primaries. Each scene brings in new hues it seems, extending out into the city. Lloyd’s late night trip back home brings out a neon-lit skyline, matching some of the format’s best scenery to date. There’s not much else to ask for than what Lego Ninjago provides. Comparatively, the difference between Lego Ninjago’s UHD and Blu-ray is substantial. Display HDR’s benefits between these two discs. Every upgrade is unmistakable. 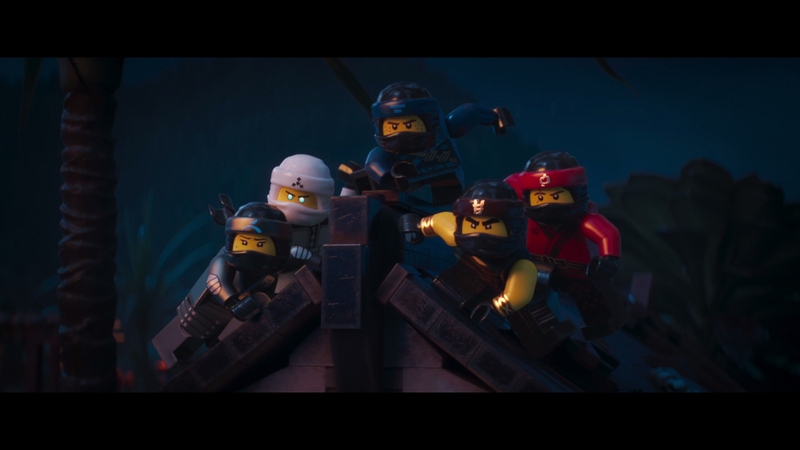 On its own, Lego Ninjago is more than fine on Blu-ray. A solid foundation of fidelity and lack of artifacts such as aliasing (impressive considering the level of line work) maintain the sharp, digital world’s qualities. The two live action scenes match in terms of clarity. A powerful base of color captures a slew of primaries. Color-coded ninjas help. Impressive contrast gives depth to this miniature realm of play. Both formats deliver Dolby Atmos mixes (with a default to DTS-HD), a hefty track with unusual levels of LFE for a kid’s feature. Lego robots stomp their feet with heightened impact. Explosions resonate. A volcano sends discarded employees out with a thump. Even the score is involved with dense music stings hammering the subwoofer. Positional use doesn’t quite match up. Crowded streets and a battle with zombies/skeletons create effortless surround effects. Missile whip past, and destruction passes through a wide soundstage. None of this comes across with prominence though, a bit reserved and held back in terms of potential. Clarity between speakers isn’t as precise as other animation. It’s fine, but better discs show off the format. Outside of a commentary from co-director Charlie Bean and members of the crew, bonus features only add superfluous value. 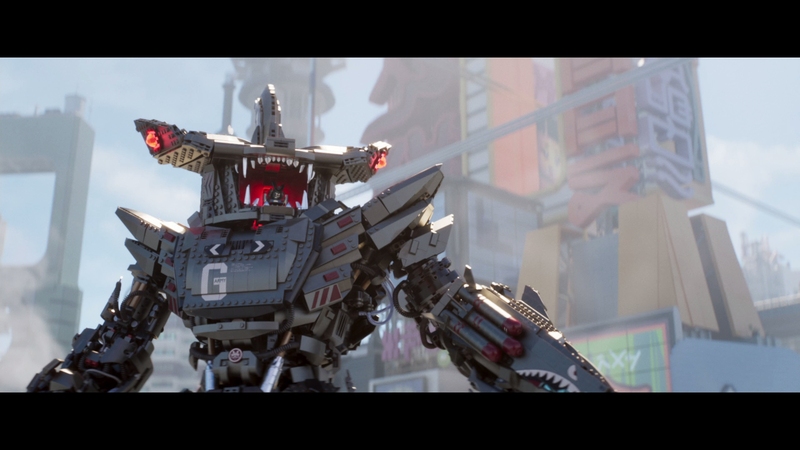 Three featurettes praise Lego, and three mini-movies expand on the brand. Three deleted scenes (with commentary) exist in various stages of completion. Animated outtakes are fun if forced. Music videos and TV promos won’t create lasting value. 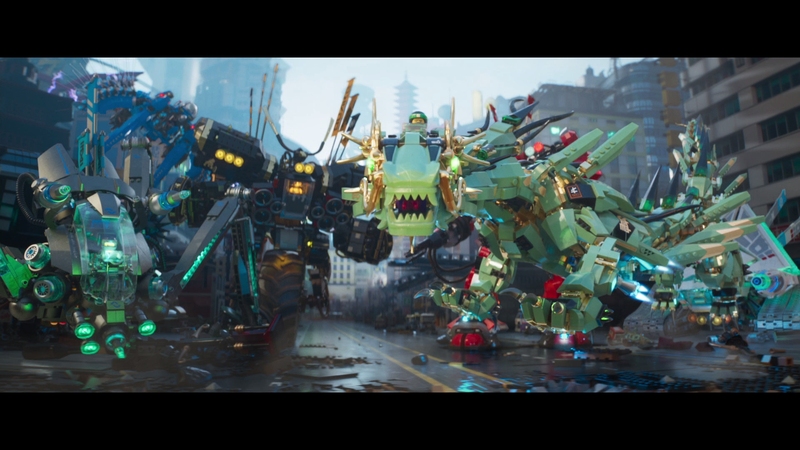 A mixture of martial arts cinema and Japanese superhero stories, Lego Ninjago has fun with the brand even as these movies slip into redundancy. The 15 unaltered images below represent the Blu-ray. For an additional 18 Lego Ninjago screenshots, early access to all screens (plus the 9,000+ already in our library), exclusive UHD reviews, and more, support us on Patreon.